Weck’s Select serves several of our classic full belly favorites, along with new favorites and weekly specials exhibiting exciting culinary creations. Born from the idea of our mission “We Strive: To do our best every day in every way and be better then you remember!” Weck’s Select comes to life to continue the Weck’s proud tradition of great food and outstanding service. The innovation of Weck’s Select aims to bring to your breakfast, your lunch, your family the best of Weck’s along with some exciting new creations. We look to push the envelope in order to bring our amazing patrons the quality food they deserve in a clean, comfortable setting. The same great Weck’s that you remember with a side of this, a pinch of that and finished with a dash of incredible. Please be our guest today! Four eggs, served with hash browns, toast, or tortilla. An egg white omelette filled with fresh spinach, mushrooms, crisp bacon and cream cheese. Topped with cream cheese, a tomato wheel and a sprinkle of chives. Sautéed mushrooms, onions, bell peppers, sprouts, diced tomatoes, guacamole, sour cream, cheddar and jack cheeses, with your choice of red and/or green chile. An egg white omelette with lean chicken breast, onions, green chile and blended cheese, topped with homemade guacamole, diced tomatoes and a side of salsa. Ham, bacon, sausage, carne adovada, fresh mushrooms and onions with cheddar and jack cheeses, with your choice of red and/or green chile. Diced ham, sautéed bell peppers and onions with cheddar and jack cheeses and your choice of red and/or green chile. Sautéed spinach, mushrooms, cheddar and jack cheeses, and your choice of red and/or green chile. Breakfast at its finest! Start with a fluffy four egg omelette and a blend of cheddar and jack cheeses, with your choice of red and/or green chile. We know you’ll love this delicious stack of our famous scratch made buttermilk pancakes. Not so hungry? Try this smaller portion of our famous scratch made buttermilk pancakes. Two fresh fluffy pancakes with a side of two bacon strips and one egg any style. Two pancakes topped with cream cheese icing, fresh strawberries and finished with whipped cream. Glorious! Two pancakes infused with crisp bacon and New Mexico green chile, served with butter and warm syrup. A sweet, spicy, savory sensation! Two blueberry pancakes served with warm blueberry compote. Two banana/pecan infused pancakes topped with more bananas and pecans! If you like French toast then you will love this mouth-watering Weck’s favorite! Three slices of our fluffy French toast. Three slices of “Belly Toast” with a side of two bacon strips and one egg any style. Three slices of French toast with a decadent banana foster topping. Three slices of delicious French toast made from sweet cinnamon raisin bread. French toast stuffed with a cream cheese filling and Maine blueberries with powdered sugar. A tasty gluten free waffle served with butter and warm syrup. Golden brown Belgian waffle served with butter and warm syrup. Belgian waffle, two bacon strips and one egg any style. Waffle topped with strawberries,bananas, and blueberries served with a side of creamy Sabayon sauce! Waffle topped with fresh strawberries and whipped cream. 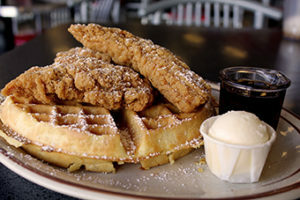 Three crispy chicken strips atop a golden brown Belgian waffle, dusted with sweet powdered sugar! Butter and warm syrup make it oh so good! Add Strawberry sauce, blueberry sauce, peanut butter chips, bananas, or chocolate chips to your pancakes, "Full Belly" Toast, or waffle. A mountain of our fresh hash browns with your choice of red and/or green chile, cheese, served with a tortilla. Plates come with two eggs, bowls come with one egg. Fresh pork marinated and slow cooked in red chile. Fresh shredded pork marinated and slow cooked in green chile. Our scratch made gravy, diced bacon and sausage. Sauteed mushrooms, onions, bell peppers, and diced tomatoes. 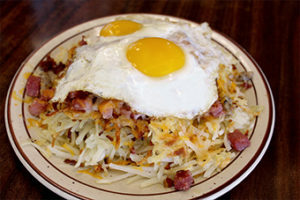 A bowl of our fresh hash browns, your choice of red and/or green chile, cheddar and jack cheeses, and one egg any style. A double portion of papas with double meat, cheese, and your choice of red and/or green chile. One or two eggs, with fresh hash browns and your choice of toast or tortilla. A classic, done up Weck's style. Start with a toasted English muffin, add a seared ham steak with two perfectly poached eggs and topped with hollandaise sauce. Finish with our signature hash browns and you have a breakfast done right! Toasted English muffin, three strips of bacon, two perfectly poached eggs, topped with creamy hollandaise sauce, and served with hash browns. Toasted English muffin topped with slow roasted pork carnitas, two perfectly poached eggs, and covered in our delicious red and green chile sauce. Topped with cheddar jack cheese and served with hash browns. Enough said! The vegetarian treat. Toasted English muffin topped with sautéed spinach and mushrooms. Finished with poached eggs and creamy hollandaise sauce and served with hash browns. Irish style with corned beef hash, toasted English muffin, poached eggs and creamy hollandaise sauce, served with hash browns. Two eggs any style atop two corn tortillas, fresh hash browns, beans, your choice of red and/or green chile, topped with cheddar and jack cheeses, garnished with lettuce and tomatoes and served with a tortilla. Our scratch made gravy and biscuits with two eggs any style. Dusted with cinnamon and nutmeg, served with brown sugar, raisins, a side of fruit, milk and your choice of toast. USDA Choice sirloin, two eggs any style, hash browns, and your choice of toast. Tender beef dipped in batter and fried to perfection then smothered in gravy and served with two eggs, fresh hash browns and toast, or choose "lunch style" with your choice of any 2 lunch sides. Our famous golden brown hash browns stuffed with two strips of honey-cured bacon, green chile sauce, and melted cheddar and jack cheese. Served with two eggs any style and one slice of your choice of toast. Breakfast Nirvana! Flour tortilla filled with bacon, ham, or sausage, three scrambled eggs, chopped green chile and cheddar and jack cheeses. Served with salsa. Three scrambled eggs folded inside a flour tortilla, smothered with red and/or green chile, cheddar and jack cheeses, served with fresh hash browns. Choose ham, bacon, sausage steak, chorizo, or no meat. Choose Carne Adovada (Fresh pork marinated and slow cooked in red chile), or Carnitas (shredded pork marinated and slow cooked in green chile). *Consuming raw or undercooked meats, poultry, seafood, shellfish, or eggs may increase your risk of foodborne illnesses, especially if you have certain medical conditions. All are served with your choice of any two: homemade potato chips, fries, gourmet onion rings, fresh fruit, cottage cheese, sweet potato fries, or substitute a small salad or bowl of soup for both sides. Turkey, fresh green chile, guacamole, bacon, mozzarella cheese, lettuce and tomato on griddled whole wheat. Cream cheese, almonds, sunflower seeds, guacamole, cucumbers, bell peppers, carrots, lettuce, tomato and sprouts on toasted multi-grain bread. Served with a small salad. Corned beef, turkey, kraut, Swiss cheese and fresh green chile on griddled rye. A town favorite. Thick sliced bacon, lettuce, tomato and avocado piled high on Artisan wheat. What more could you want? Grilled chicken breast, sliced avocado, and melted white cheddar cheese, lettuce, and tomato on a hoagie roll. All of our burgers are 7 oz. of the finest USDA choice lean ground beef, served on a toasted specialty bun with lettuce, tomato, onion and pickle chips. All are served with your choice of any two: homemade potato chips, fries, gourmet onion rings, fresh fruit, cottage cheese, sweet potato fries, or substitute a small salad or bowl of soup for both sides. 1/2 pound all beef patty, sauteed onions, topped with melted cheddar cheese, lettuce, tomato and homemade Frisco sauce on 2 slices of grilled sourdough. 7 oz. all beef patty, bacon slices topped with Wisconsin cheddar. 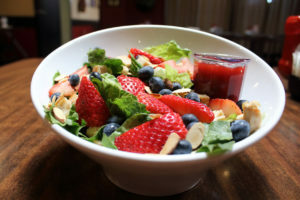 Fresh strawberries, blueberries, toasted almonds, chicken breast, and crispy romaine. Served with our house-made raspberry jalapeño vinaigrette. A crispy homemade tortilla bowl filled with your choice of chicken or seasoned ground beef, beans, lettuce, tomatoes, black olives, shredded cheddar cheese, sour cream and guacamole. Served with salsa or your choice of dressing on the side. Scratch made stew made with tender chicken and fresh green chile. Served with a tortilla. Grilled chicken, fresh romaine lettuce, tossed with caesar dressing then topped with croutons and Parmesan cheese. Changes daily. Ask your server about today’s soup. One of our famous scratch-made buttermilk pancakes, and your choice of either two slices of bacon or one sausage patty. Two slices of French toast, and your choice of either two slices of bacon or one sausage patty. One biscuit topped with gravy and served with hash browns and two eggs any way you want them. All lunch items include your choice of coffee, tea, hot tea, or soft drink. These menu items are eligible for 10% senior discount. Sorry, no substitutions. Your choice of a carne adovada, carnitas, chicken, or beef burrito. Topped with cheese and garnished with lettuce and tomato. Served with hash browns and beans and your choice of red and/or green chile. Any 1/2 sandwich and cup of green chile chicken stew or soup of the day. Served with a sampling of Weck’s Fresh Homemade Potato Chips. Crispy fried chicken tenders on a bed of romaine lettuce, tomatoes, carrots, cucumbers and mixed cheese. Served with the dressing of your choice. Dinner salad served with your choice of dressing and bowl of green chile chicken stew or soup of the day. Your choice of a beef, chicken, or veggie lunch-size quesadilla. Garnished with lettuce, tomato and sour cream. A bowl of our Olde Fashioned Oatmeal with brown sugar and raisins, and served with one slice of toast. Two eggs cooked any way you want them, hash browns, one slice of toast, and your choice of either two slices of bacon or one sausage patty. Your choice of either ham, bacon, or sausage and mixed cheeses. Served with hash browns, one slice of toast, and your choice of red and/or green chile. All Kids Menu items come with a drink. With scrambled egg, diced bacon, hashbrowns, and cheese. Lunch items are served with one side. 6 turkey dogs dipped in whole grain batter, served with one side. Four eggs served with fresh hash browns, tomatoes or cottage cheese. Diced ham, cheddar and jack cheeses, choice of chopped green chile or salsa. Sauteed mushrooms, onions, bell peppers, sprouts, diced tomatoes, guacamole, sour cream, cheddar and jack cheeses, choice of chopped green chile or salsa. Diced bacon, sauteed bell peppers, diced tomatoes, guacamole, cheddar and jack cheeses, choice of chopped green chile or salsa. Diced ham, sauteed bell peppers and onions with cheddar and jack cheeses and choice of chopped green chile or salsa. Sauteed spinach, mushrooms, cheddar and jack cheeses, with chopped green chile. Breakfast at its finest! Start with a fluffy four egg omelette and a blend of cheddar and jack cheeses. All of our burgers are one half pound of the finest USDA choice lean ground beef, with lettuce, tomato, onion and pickle chips. All are served with your choice of any two: fresh fruit, cottage cheese, or substitute a small salad for both sides. A mountain of our fresh hash browns and cheddar and jack cheeses, and choice of chopped green chile or salsa. Plates come with two eggs any style, bowls come with one egg, served with a steamed corn tortilla. A bowl of our fresh hash browns, cheddar and jack cheeses, and one egg any style. A double portion of papas with double meat, and cheese. Two eggs any style atop two steamed corn tortillas, fresh hash browns, chopped green chile, topped with cheddar and jack cheeses, garnished with lettuce and tomatoes. Charbroiled diced chicken breast, fresh green chile, cheddar and jack cheeses, diced tomatoes, black olives, cucumbers, carrots, bell peppers, and sunflower seeds atop a bed of our romaine lettuce. Cheddar and jack cheeses, tomatoes, cucumbers, carrots, bell peppers, and sunflower seeds atop a bed of our romaine lettuce. Grilled chicken breast, fresh romaine lettuce, tossed with caesar dressing then topped with Parmesan cheese. Tomatoes, cucumbers, carrots, bell peppers, croutons and sunflower seeds atop a bed of our romaine lettuce.